Ninety Eight - thanoscardgamess jimdo page! Ninety eight and Ninety nineare adding games, in which the values of the cards are added together as they played in a single pile, the object being to avoid taking the total above the target score (98, 99 respecively). 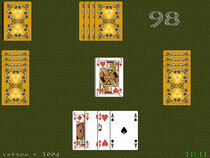 In Ninety-eight, four cards to each player are dealt and the remainder are placed face down to form the stock. At your turn you play one of your four cards to the face up pile, call out the new value of the pile, and then draw the top card from the face down stock to replace the card you played. Played cards affect the value of the pile. The aim is to avoid taking the value above 98. The first person who makes the value of the pile more than 98 loses. Ninety-nine is an advanced form of this adding game. This game should be played very rapidly. It is easy to forget to draw a replacement after you play a card. If that happens it cannot be corrected afterwards - you must get by with just two cards for the rest of the hand.